If you’re like most people you have top desk drawer chock full of business cards that you’ve collected at conferences and other business meetings. Of course you’ve collected them with the best intentions of manually entering them one-after-another into your computer – but somehow they sit unentered in that top drawer. Someday when you have extra time you’ll sit down and enter them all into your computer. At last there’s a cheap and easy solution to automatically enter the information on most business cards to your computer. If you have an iPhone 3GS there’s a new inexpensive software application called Business Card Reader from Shape Services that you should try. For only $5.99 you can download it to your iPhone 3GS (other versions are supported but because the 3GS has a higher resolution auto-focus camera this is the preferred model). Use the application to take a picture of a business card. Here’s a really lousy sample of a business card from a prospective client that I collected about a year ago. I took this picture with my iPhone 3GS in the dim light of my kitchen. And unbelievably this $5.99 program transcribed the business card perfectly. In this instance the contact phone, address and email were all exactly as they should have been – despite having been capture off a dimly lit photograph of a business card. Total time from image to transcription? About a minute. Certainly in many instances you might have to tweak the final address if the program doesn’t read the information perfectly. Total time from taking the image to having a new contact in my iPhone? About a minute. Because I use Google Apps for my email and contact management I am also able to use the free iPhone GoogleSync program to automatically synchronize contacts off the iPhone directly to my Google Apps account. The end result is a business card accurately scanned from any iPhone 3GS into your iPhone contact database. If you are synchronizing that data to Google Apps then the contact information will also synchronize in real time. In a message sent to all North American Channel partners late last night, Sage North America President Jodi Uecker-Rust and Sage EVP Paul Johnson bestowed the honor of Chairman and Presidential Clubs on DSD Business Systems of San Diego California and their related Premier Partners. Schulz Consulting has been a member of the DSD Premier Partner family which provides us with access to programming resources as well as the technical skills of the other member organizations while still servicing all of our clients locally. Schulz Consulting is now active on the new Google Wave service that’s presently in a limited preview release. Google Wave is the next step beyond email. It allows for real time group conversations where every participant can view a complete history of the discussions. 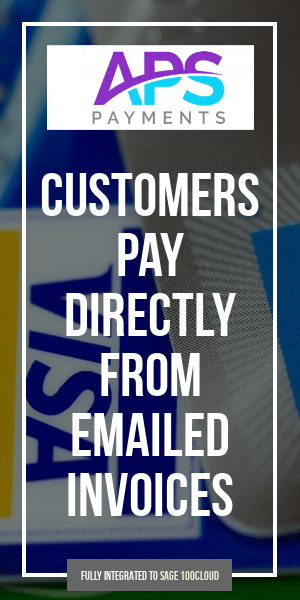 Simple email exchanges often omit large parts of conversations to anyone not on the email distribution list. 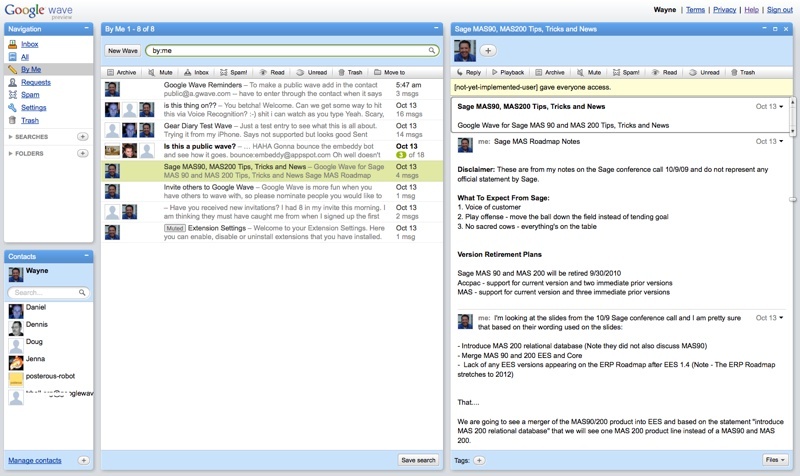 Future uses of Google Wave may involve collaborating on workarounds for software issues, real time seminars where participants can comment and add to the topics as well as technical support tracking where more than one company contact could have access to a complete history of the items that have been discussed. Because Google Wave is in a limited testing preview you must first request an invitation from Google to participate (request).